BOGE Nitrogen Generators use the pressure swing principle or Pressure Swing Adsorption (PSA) method to generate nitrogen. This involves passing purified compressed air through a container that contains a carbon molecular sieve (CMS), whereby the oxygen molecules in the air are absorbed while flowing through. This adsorption process continues until the activated carbon is saturated with oxygen molecules. The same process then starts in the second container while the saturated container regenerates itself. This process takes place in every single module. The result: Nitrogen with a stable purity grade of up to 5.0 (99.999%). 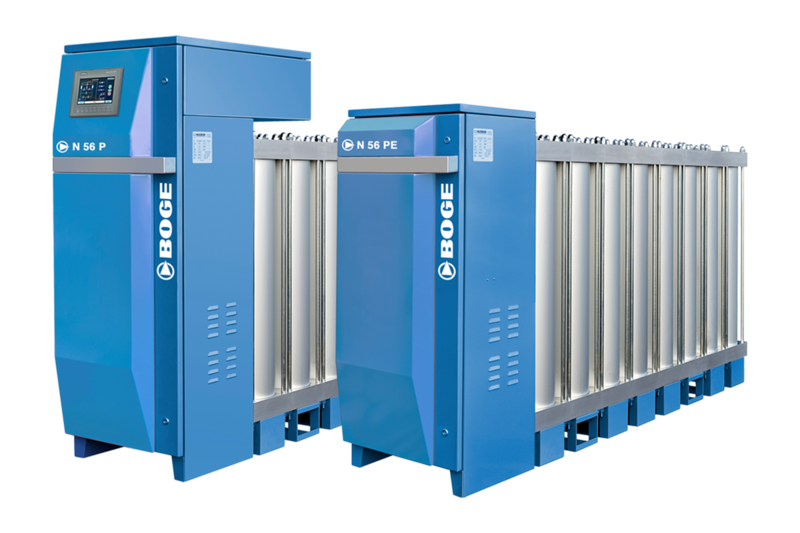 Thanks to their high-quality components, BOGE Nitrogen Generators are practically maintenance-free. The valves, the adsorber material, and the zirconium oxide sensor ensure a smooth operation and a reliable quality of the nitrogen. This means minimum service costs! 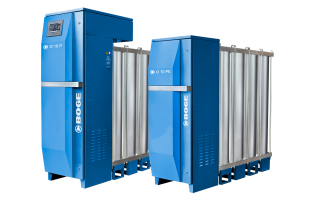 With BOGE Nitrogen Generators you can adjust the purity level, delivery flow, and nitrogen output flexibly at any time to suit your current requirements. The generator's waste in energy or money in producing nitrogen that is purer than required or on over-dimensioned systems. BOGE Nitrogen Generators adapt to suit you, not the other way around! BOGE Nitrogen Generators are filled only with high quality CMS adsorber material. All of the materials used are of the highest quality and the manufacturing process is rigorously monitored, ensuring you receive a system with impressive reliability and maximized service life. BOGE Nitrogen Generators can also be equipped with microprocessor controls or with convenient touch screen controls. The controls can operate in a network via a standard modem or GPRS. An optional remote control feature via an Ethernet interface is also possible. The modules are simply screwed on and can be expanded at any time as required to allow optimal adjustment of the nitrogen output to suit your actual requirements. The modular concept offers greater flexibility to traditional twin tower PSA generators, as the BOGE generators can be multi-banked and configured to suit higher flowrate applications, or can be added to installations as and when the nitrogen demand increases. Additional modules can provide extra capacity on standby or service backup for peace of mind. Outputs from 1.3 to 265.8 Nm³/hour can be achieved. The nitrogen output can be flexibly increased beyond this limit by combining complete systems. Controls are only required for the master unit from where all of the banks can be centrally controlled. Only the use of BOGE original parts will enable you to benefit from the technological edge of the N-series in the long run. To this purpose, CRU AIR + GAS offers individually customized replacement parts for the N-series guaranteeing 100 percent quality and 100 percent service life. Only such original parts are compatible with the compressors of the N-series for maximum safety during the entire service life period.